Ithea, 2007. Carbon print 13cmx19cm on satin paper Fabriano Artistico Traditional White 38cmx56cm, natural border. The tactile characteristics of the carbon print can be appreciate only watching the real print. All the images of the “I demoni” series are shot with a catadioptric objective, a lens gifted with a particular bokeh, that gives a particular out-of-focus. 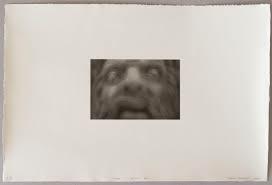 In fact, even if the out-of-focus is intense, the objects have an important spatial structure, as it was a superimposition of the different images. The sign of the catadioptric objective is occasionally visible in those little rings superimposed to the image, partial or complete, which are the luminous marks of points deformed by the ring diaphragm of the objective. Pictures are voluntarily out-of-focus to exploit this category of mirrored objectives and are voluntarily under-exposed to obtain a dark and gloomy atmosphere. The subjects of the series are the sculptures of the grotesque masks of the Pont Neuf in Paris. They should have been primarily on the Germain Pilon (1528?-1590) and they were often substituted during the centuries due to the stone decay. Even if the shot has been taken digital, the editing of the image is limited to current intervention under the enlarger: contrast managing, vignetting, Dodging and burning. 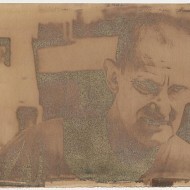 The passage from digital to traditional carbon print happens thanks to the usage of an ink jet negative, a modern and still experimental technique, which allows the closure of the circle between a technology born at the beginning of photography history and the most advanced technology available today. Prints are realized by Damiano Bianca, one of the best Italian carbon printer. The support is Fabriano Artistico traditional white 300g/m2 paper, hot pressed, therefore satin surface, essential for the velvety giveback researched in the series of i demoni. The absence of chemical whitening agents, which gives the pleasant warm tone of paper, as well as the absence of chlorine and acids together with 100% cotton fibers, makes Fabriano Artistico traditional white a beautiful paper with an excellent conservation in time. Watercolor (finer and better quality than tempera) used to print are a mixture of two colors. The basis is carbon black, probably the first pigment of the human history and the nearest to vintage carbon print. It is an almost neutral black, gifted of an excellent stability. It is not attacked by light either by acids or alkali. The second ingredient is Payne grey, a mixture of black and blue (a mixture of Prussian blue or ultramarine and ivory black, with a little hint of red). Once again its stability is outstanding, as it is created only with natural clays. It has been used for i demoni carbon prints, because it is a cold grey, which allows to counterbalance the warm tint of the used paper. Cold prints are generally more contrasted in shadows; since i demoni are dark pictures, it is essential not to use warm pigments. 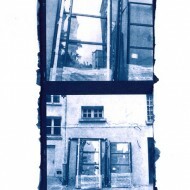 It is possible to buy Mascarons du Pont Neuf carbon prints at the gallery http://chambre-avec-vues.com.